From the most ambitious architecturally driven, frameless structural glass project to the simplicity of glass balustrades, Glassrooms offers a complete range of glazing solutions. Our services include bespoke, practical design advice, in-house manufacturing, integration of sliders or bi-folds, project management and high-quality installation and commissioning - all at extremely competitive rates. The GlassRooms system has been designed by award-winning architects, structural glass engineers and leading independent test engineers. Constructed from toughened glass units which are strong enough to walk on, GlassRooms are highly durable and easy to maintain. At GlassRooms Architectural Glazing we offer glazing solutions from design to complete "turn-key" installations. Whether it's a Contemporary GlassRooms, balustrades, roof glazing, roof lights, walk-on glass floors or commercial projects, the GlassRooms team is ready to support you with your project. GlassRooms offer lead-times like no other. Our manufacturing facility on the Wirral uses state-of-the-art manufacturing technology, producing your bespoke solution with millimetre precision. This enables us to deliver end to end projects under our control with aggressive lead-times. We utilise an ethos of consultation and project management which ensures that the project brief is clear and manageable at all stages. This approach not only guarantees transparency but also perfectly designed and installed GlassRooms systems. 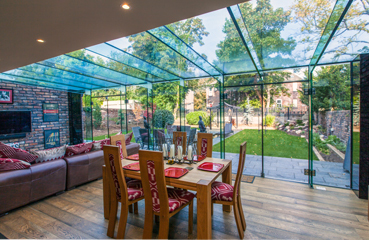 By utilising the latest specifications of low e-thermal coating and argon filled panels, your GlassRoom is guaranteed to exceed the rigorous new heat efficiency regulations and remains comfortably warm even in the most extreme conditions. Are you an architect or designer looking to develop a specialist solution? Work with the GlassRooms R & D team to find solutions for your most challenging project. Come and test solutions at our manufacturing facility with a team that have over 70 years experience in the glass business.